Hakusan, Japan, October 4, 2017 – EIZO Corporation (TSE: 6737) today announced the release of the RadiForce MS236WT, a 23-inch 2MP multitouch monitor with palm rejection technology and active stylus pen compatibility for smooth and detailed handwriting input. 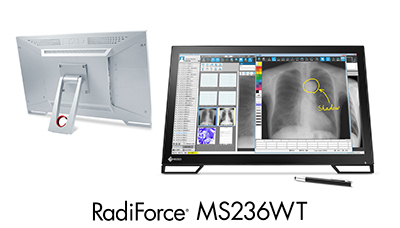 It is the successor model to the RadiForce MS235WT and features improved functionality and a DICOM Part 14 preset mode. The monitor comes with a DICOM Part 14 preset mode, which is adjusted to the correct grayscale tone at the factory. This is optimal for viewing DICOM medical images during clinical review. The RadiForce MS236WT meets the strictest medical and safety standards such as the CE (Medical Device Directive) and EN60601-1 for installation in clinics and hospitals. The RadiForce MS236WT will begin shipping in December, 2017. Date of availability varies by country so contact the EIZO group company or distributor in your country for details.